This workshop has been planned around the New Moon cycle to maximize the visibility of the Milky Way and other features of the night sky. 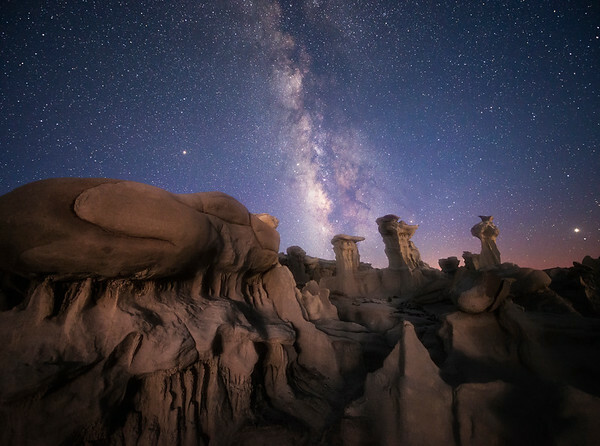 Join us for four days of sunset and night sky photography & image processing in the high plains desert area of northwestern New Mexico. 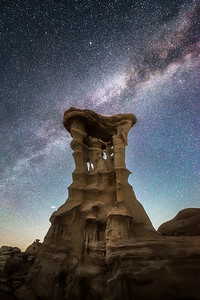 The part of the country is truly sublime - colorful and scenic, amazing and desolate - and it contains some of the most unique hoodoo arrangements found anywhere in the US southwest. 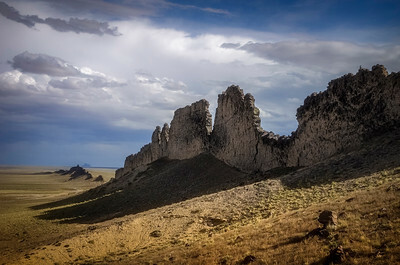 Time and natural elements have etched a fantasy world of strange rock formations made of sandstone, shale, mudstone, coal, and silt. 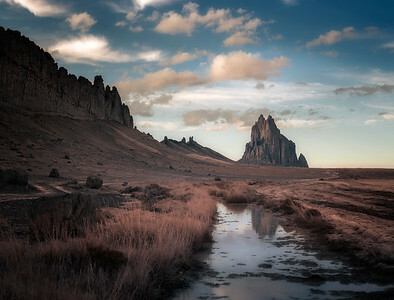 During this workshop we will be visiting the iconic Shiprock volcanic area and the Valley of Dreams section of the Ah-Shi-Sle-Pah Wilderness Study Area. In early June the sun sets around 8:45PM. 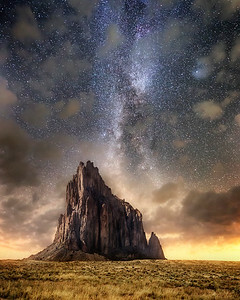 The Milky Way begins to rise around 10:30PM and appears as an arc in the sky. We'll be heading out to our shooting locations before sunset to photograph the sun going down and shortly afterwards, the rise of the Milky Way. We have hired a Navajo guide to comply with all regulations when visiting these sacred lands. 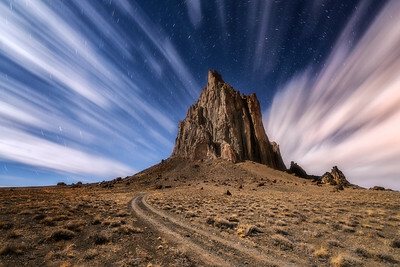 We will be meeting up with our Navajo guide before sunset and photographing for 5+ hours each night. 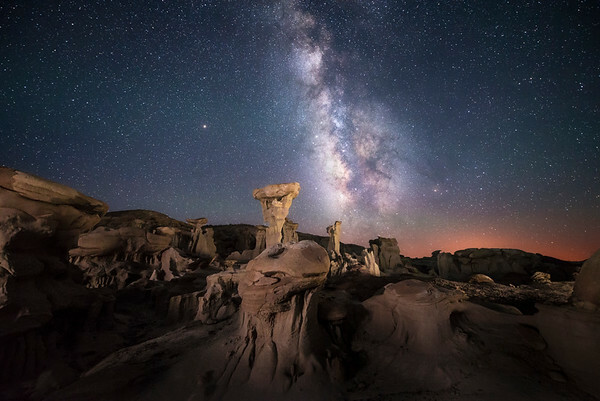 This is a comprehensive workshop that will consist of 2 nights and 2 days - approximately 11 hours of in the field photography and 10+ hours of classroom tutorials & processing time. Check out our Processing page for some examples of what we will be covering in class. In The Field Photography: We will be covering the entire skill set of shooting during sunset and all facets of night photography including the techniques involved in taking very long exposures for foregrounds to blend with sky shots and how to use LED panels strategically to illuminate landscape features. 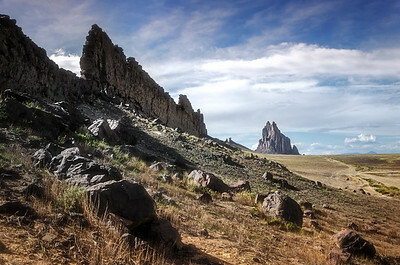 We will also be covering the process of shooting horizontal & vertical panoramas as time permits. Mike and Sonia will help each participant with composition, lighting, troubleshooting, etc. Classroom Instruction: Our classroom time will mainly consist of processing tutorials and techniques via Lightroom & Photoshop and some of our favorite plug-ins to create remarkable images. Bring your laptop with Lightroom and Photoshop installed to learn techniques for processing in the digital darkroom. We will cover Mike's digital darkroom workflow from RAW file to finished image - from the basics of adjusting highlights & shadows, white & black levels, contrast, clarity, noise reduction, color balance, sharpening, lens corrections, graduated & radial filters, etc. to the more advanced techniques involved in layering, masking, transforming and blend modes in Photoshop. We will also go through detailed instructions regarding the capturing & processing of images featuring exposure blending, horizontal & vertical panoramas and star trails images as time allows. Mike will work with each participant on their images as we progress. Check out our Processing page for examples. The planning and scouting of night sky shoots, including the apps that are instrumental for reconnaissance, will be covered as well. Home Base: Our home base for this workshop is the Home2 Suites in Farmington, New Mexico where we have reserved a block of rooms at a reduced rate. 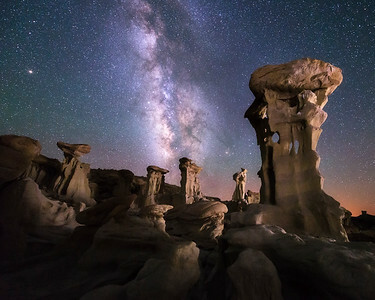 To reserve your room, call 505-325-1500 and tell them you are with the Mike Taylor Photography Workshop in June 2019. You are of course free to stay anywhere in the area. We have reserved the conference room at the Home2 Suites for all our classroom and meeting needs. Lodging, transportation and meals are not included in the investment amount. We will be carpooling to the photography locations where we will meet our guide. NOTE: Getting to our shooting locations requires a high clearance vehicle and 4WD is recommended in certain spots. Some of our clients will be driving their own Jeeps/SUVs and will be accepting other passengers. Anyone who can attend this event with a high clearance vehicle with 4WD and room for other participants would be very much appreciated. Thanks! Physical Requirements: Boots or shoes with decent tread are necessary. One of our nights we will be hiking 2 miles total over fairly level ground with some sandy sections going up & down through washes and some minor climbing up some rocky sections. Those in reasonable health will have no problems with this. Anyone who has balance issues should contact us before signing up. Investment: $2,100 per participant* - Alumni discount of 20% if you've taken a previous workshop with Taylor Photography. A non-refundable 50% deposit is required to reserve a spot or you may pay in full. The full balance is due 60 days before the workshop or your reservation will be subject to cancellation. Please contact us ASAP if issues arise. *This amount includes a per person, per night fee for our Navajo guide - without which we could not legally photograph these sacred lands.